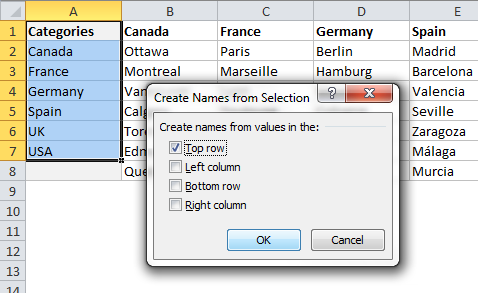 In a previous post we learned how to make an Excel drop-down menu in 3 minutes. In this post I will show a very easy way to make a drop-down list in Excel that changes depending on what you have chosen in another cell. It’s easy, and it only takes five minutes! It is absolutely critical that the data table is set up correctly: The main category (the countries in this example) should be in one column, and the sub-categories (the cities) in the other columns, with the countries repeated as headings. Important: The heading of each sub-category must be exactly the same as the name in the main category. Select all the entries in a column and use the shortcut Ctrl + Shift + F3 to create a name for the range. Repeat this with every column. It is very important that the names of the sub-category ranges are the same as the names in the first column, otherwise the dynamic drop-down list won’t work. Let’s make the first drop-down, the one for the countries. Select a cell, e.g. I3, and choose Data Validation on the Data tab (or shortcut Alt→D→L). Choose List, put the cursor in the Source field and press F3 to open the Paste Name window. Choose the range Categories. That’s it, we have created a dynamic drop-down menu! If you change countries in I3, the list in J3 will update! Youtube (in Norwegian): Lag en Drop-down-meny i Excel på 1 minutt! This entry was posted in Tutorials and tagged Drop-down, Easy tricks, Excel, Tutorial by Audun Danielsen. Bookmark the permalink. I don’t think I am missing anything, but perhaps you can enlighten me! I had the same problem and changed category names to being one word only (no ‘_’ or ‘-‘ as well). I realised as some categories worked and others didn’t before I changed all to one word names. An error message still appeared but all seems to be in order! Check if your INDIRECT formula points to the right cell, i.e. the cell with the drop-down for the main categories. Is there an easy way to extend this validation to an entire column, so that the value in T3 formats the dropdown in V3, T4 formats the dropdown in V4 and so on? I tried using the format painter and just copying and pasting the formula and neither works. Thanks! Maybe add that the names of the categories can’t exists of multiple words. You have to add _ between the separate words instead of a space, or you will get errors. My values in the drop-down menu don’t match the values that appear in my worksheet. How do I make adjustments so I get what I expect? Thanks. If you have named the ranges with exactly the same names as in the Category column it should work.